Little Learners Love Literacy teaches children to read, spell and write with confidence. It is developed from evidence-based research with explicit activities to engage children's interest while teaching phonemic awareness and phonic skills to learn to read and write. Some sounds are easier for children to say, feel and hear. For this reason, we have introduced the sounds, /m/, /s/, and /f/ first and sequenced all sounds into 4 stages. 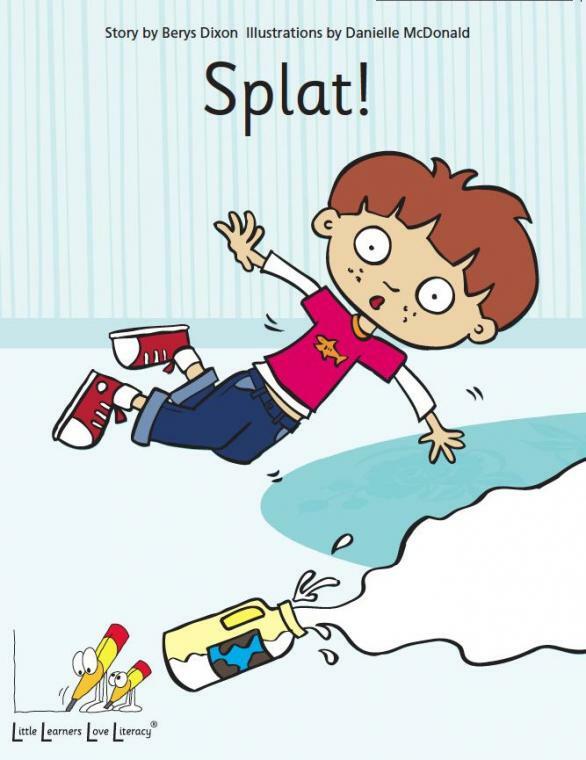 Vowel sounds should never be introduced close together as they are tricky, however, at least one vowel needs to be introduced early so that children can make words. It makes no sense to teach children letters and sounds, without teaching them how to blend these sounds together to make words. 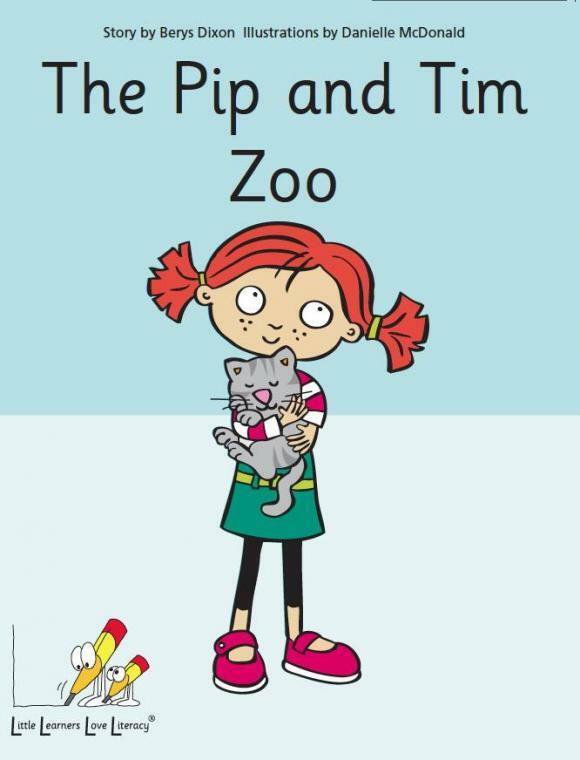 Once children know the first 8 sounds in Stage 1, they start reading five decodable Little Learner books to put their skills into practice. These stories are about Pip and Tim, their family and pets. The focus is on reading and decoding the words, not looking at the illustrations and guessing. Children feel success from the beginning and begin to understand what reading is all about. 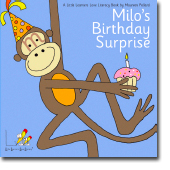 It is Monday morning in March and it’s Milo the monkey’s birthday. Milo wants to celebrate with his friends at the park so he decides to ring them. 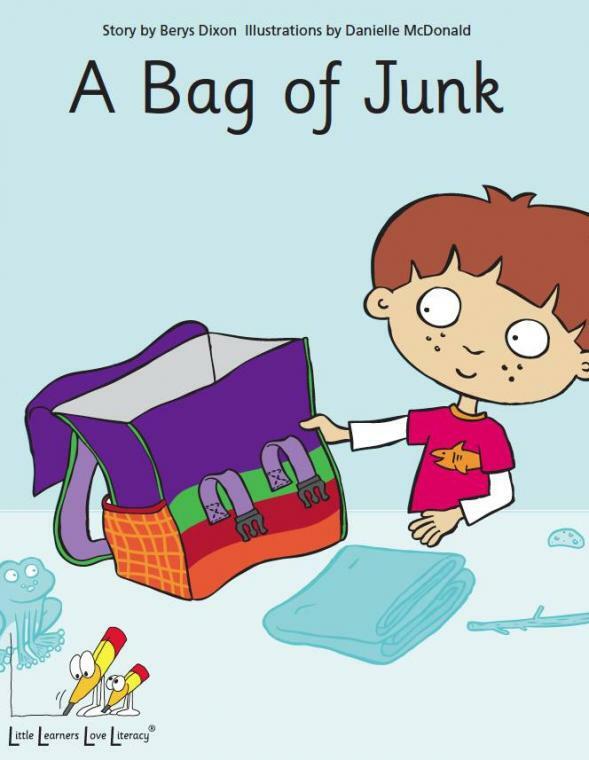 Milo begins to feel really miserable as all of his friends are busy – Sally the snake is skateboarding down a steep slope, Harry the hippopotamus is hiking up the hill to his house. Why doesn’t anyone answer the phone? This is a delightful way of introducing letters and sounds to children using the names of the Milo’s animal friends as a memory jogger. Includes 2 CDs - Milo's music CD and a blackline master CD plus Ally the alligator puppet. Ally is very special as she only talks in sounds. A great way of teaching segmenting and blending. 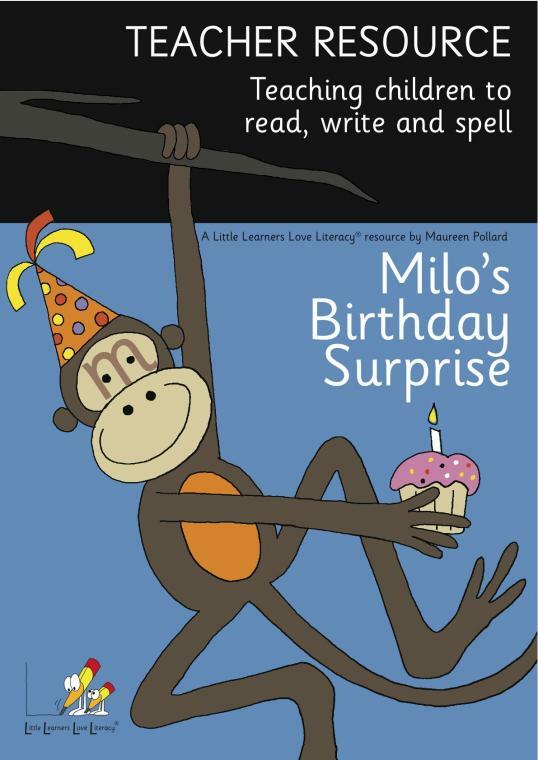 This practical resource with 26 explicit teaching sessions explains how to engage children in the learning process of reading, spelling and letter formation using Milo's Birthday Surprise. 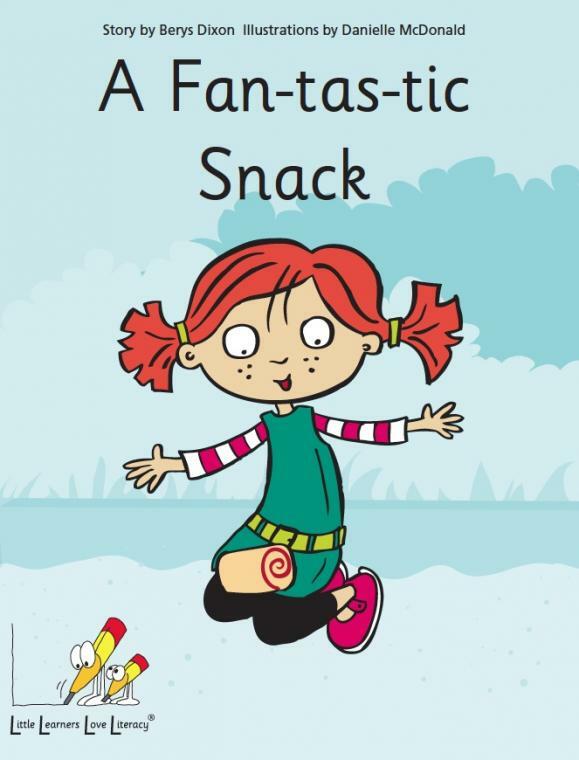 A pack of 80 cards with 10 top literacy games to help children learn the alphabet sounds. 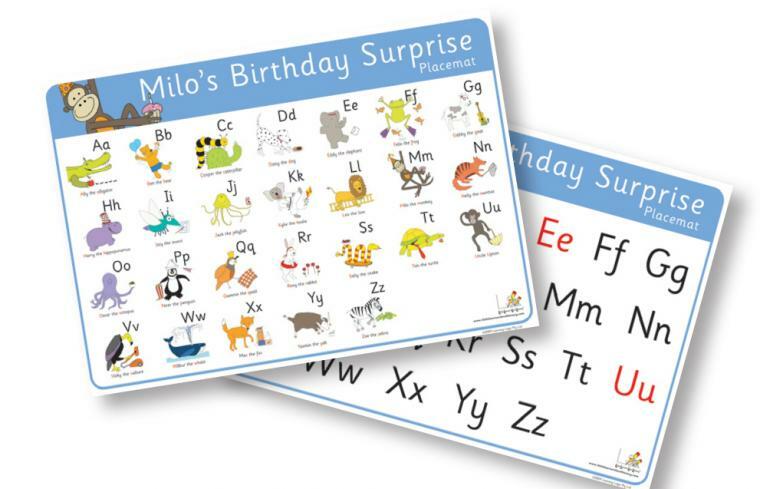 Milo's Alphabet Games has 26 a-z letter cards plus 2 picture cards for each letter of the alphabet. 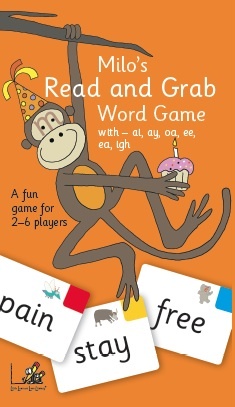 Additional cards have numerous ideas for teaching children to spell more than 200 words. What a great start to literacy learning! Use these cards for 'Speed Sounds' fluency practice. A must for every Prep or Kindergarten classroom. Learning the alphabet sounds is just like learning to play a musical instrument - daily practice is important. 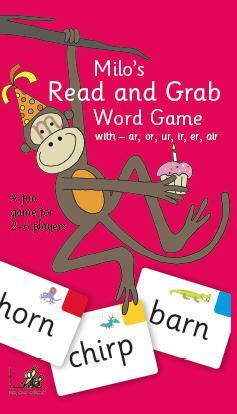 Flip over alphabet cards to make more than 200 words to spell and read. 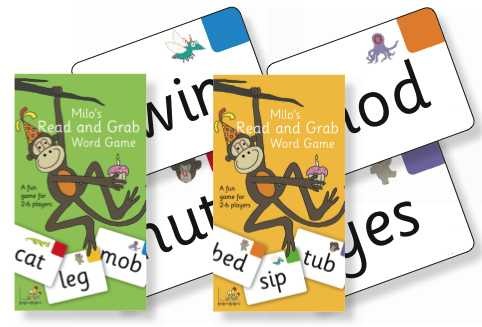 Milo's flipbook provides a super way of combining reading and spelling with a 'hands-on' literacy activity. It is even more fun creating nonsense words and real words. Did you know that 'ck' follows a short vowel sound. Use the flipbook to see how many words you can make. 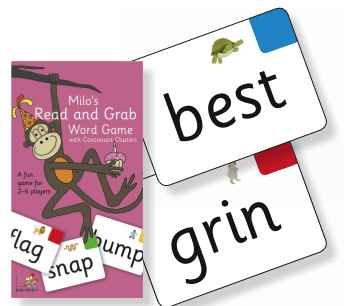 Milo's Read and Grab Word Games - children practise reading and decoding words while having fun. They don't even realize they are reading. Now there are 7 games covering the 44 sounds of the English alphabetic code. 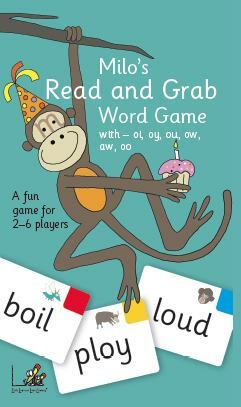 Each set has 75 word cards so that each game can be varied with new words. 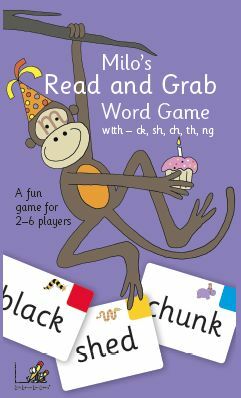 The purple Read and Grab game focuses on 'consonant blends'. These are words with 2 consonants at the beginning or end of the word, such as snap, plant, crust. Children need as much practice as possible to achieve success. All words can be decoded. This laminated placemat with Milo's friends on one side and the plain letter shapes on the other, provides fun opportunities to talk about letters and sounds. Two laminated placemats that enable children to identify and circle letters/sounds in a sequence to make words. It also includes -ck ending. The rule being that after a short vowel sound in a one syllable word the /c/ sounds had the letters -ck. The placemat also includes -ll, -ff, -ss plus instructions and lists of words which can be made. 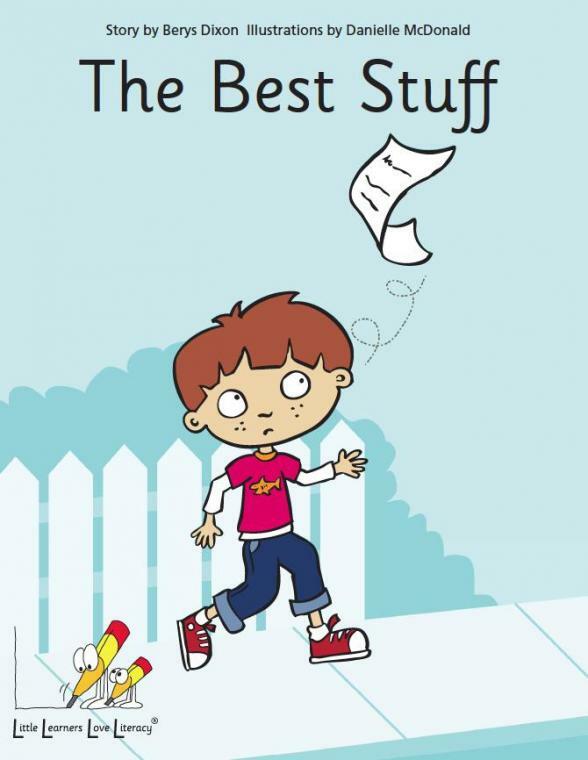 A super resource that can be used over and over again. Each placemat has instructions and lists of words on the back. Very easy to use to teach children the sequence of sounds in a word. The first steps in writing! Knowing the relationship between sounds and letters is important for reading and spelling. Sound Swap teaches this in an interactive word game. Children enjoy swapping cards to make new words. 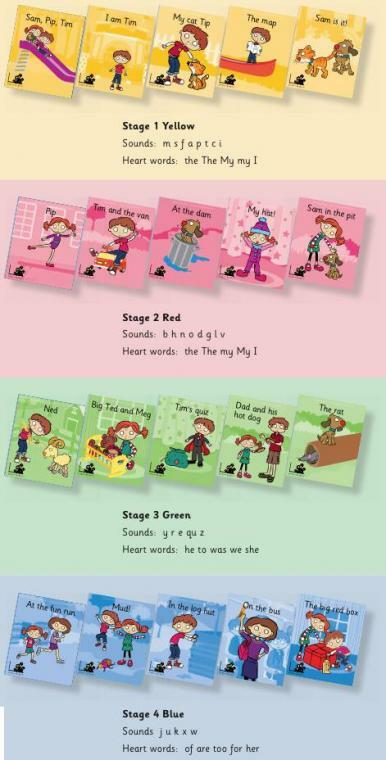 The 49 cards, as shown below, are colour coded to match the stages in Little Learners Love Literacy. There are 25 little books divided into 5 stages. Each stage is carefully sequenced to give children confidence and success. All Little Learner books are expertly levelled to support readers as they move through the stages of learning to read. Each stage has a small number of Heart words - high frequency words that children need to learn by heart. At the back of each book there is a 'vocabulary check' and 'questions to talk about' section.